A fiber optic cable is a network cable that contains strands of glass fibers inside an insulated casing. They're designed for long distance, high-performance data networking and telecommunications. Fiber optic cables carry communication signals using pulses of light generated by small lasers or light-emitting diodes. The two primary types of fiber cables are called single mode and multi-mode fiber. 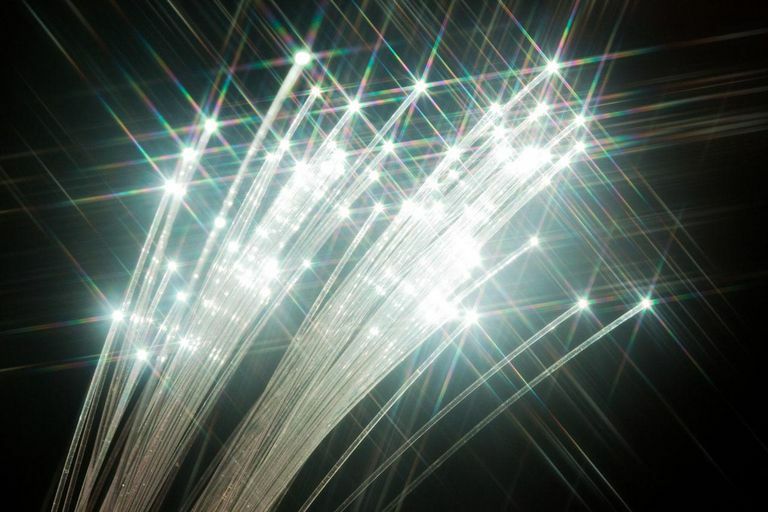 Single mode fiber uses very thin glass strands and a laser to generate light while multi-mode fibers use LEDs. Single mode fiber networks often use Wave Division Multiplexing techniques to increase the amount of data traffic that can be sent across the strand. WDM allows light at multiple different wavelengths to be combined (multiplexed) and later separated (de-multiplexed), effectively transmitting multiple communication streams through a single light pulse. Fiber is less susceptible to interference. A copper network cable requires special shielding to protect it from electromagnetic interference. While this shielding helps, it is not sufficient to prevent interference when many cables are strung together in close proximity to each other. The physical properties of glass and fiber cables avoid most of these problems. Whereas most fiber is installed to support long-distance connections between cities and countries, some residential internet providers have invested in extending their fiber installations to suburban neighborhoods for direct access by households. Providers and industry professionals call these "last mile" installations. FTTC/N (Fiber to the Curb of Node): Fiber that is laid to the node but then copper wires complete the connection inside the building. The term dark fiber (often spelled dark fibre or called unlit fibre) most commonly refers to installed fiber optic cabling that is not currently being used. It sometimes also refers to privately operated fiber installations. Why Is Everyone so Excited About Google Fiber? Why Is It Called Fibre Channel Instead of Fiber Channel?